Looks like were going meatless today and staying healthy is one reason why you should have this Cauliflower Recipe. For veggie lovers let me introduce another vegetable recipe for vegans out there! Let me share this wonderful recipe coming from Tori Avey, topped with gracious amounts of olive oil, smoked paprika and salt. Place a rack in the center of your oven and preheat to 400 degrees F. Line a baking sheet with aluminum foil for easier cleanup, if desired. Pull the leaves off of the cauliflower base. Cut off the lower part of the stem. Slice each quarter into 6-8 pieces. You want as many flat surfaces as possible on each floret– the flat surfaces caramelize best. Caramelization is the key to giving the roasted cauliflower flavor. Give all the florets a thorough rinse in a colander. Shake them dry. Spread out the cauliflower on your baking sheet or pan. Reserve any small bits of cauliflower that have fallen away from the florets in a small bowl. Drizzle the florets evenly with 1 tbsp olive oil. I use a measuring spoon of olive oil, which makes it easier to gauge how much oil I’m using, rather than pouring straight from the bottle. Toss the florets to coat them fully with oil– I use clean hands for this step. 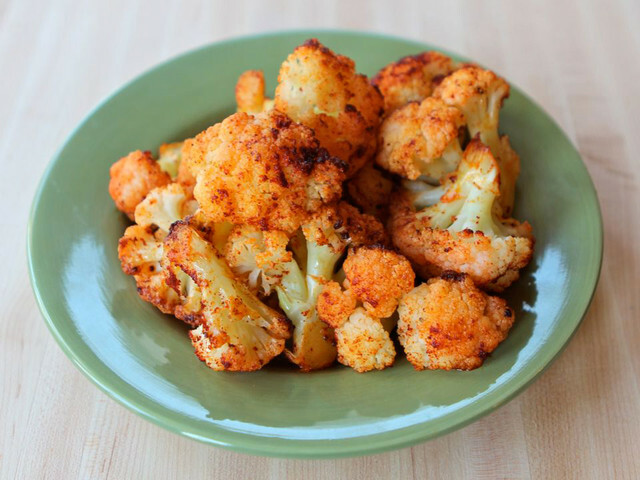 Sprinkle the cauliflower evenly with smoked paprika and salt to taste. Be generous with the salt– smoked paprika really sings when it’s combined with salt. Place the baking sheet into the preheated oven and let the cauliflower roast for 10 minutes. While cauliflower is cooking, drizzle 1/4 tsp of olive oil into the small bowl of reserved cauliflower bits that have fallen away from the florets and toss to coat. Sprinkle them with smoked paprika and salt. You will add these to the sheet a little later so they won’t burn. After 10 minutes, remove the baking sheet from the oven. Sprinkle the reserved cauliflower bits onto the baking sheet.